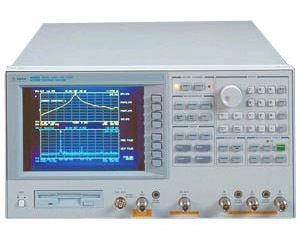 When combined with a test set, the Agilent 4396B provides reflection measurements, such as return loss, and SWR, and S parameters. As a vector network analyzer, the Agilent 4396B operates from 100 kHz to 1.8 GHz with 1 mHz resolution and its integrated synthesized source provides -60 to +20 dBm of output power with 0.1 dB resolution. The dynamic magnitude and phase accuracy are +/-0.05 dB and +/-0.3 deg so that it can accurately measure gain and group delay flatness, which are becoming more important in modern electronics systems. As a spectrum analyzer, the 4396B operates from 2 Hz to 1.8 GHz with resolution bandwidths (RBWs) spanning 1 Hz to 3 MHz in a 1-3-10 sequence. A fully-synthesized local oscillator allows stable and accurate frequency analysis. Direct A/D conversion (no LOG amplifier is used) results in +/-1.0 dB overall level accuracy. Noise sidebands fall below -105 dBc/Hz offset 10 kHz from carriers below 1 GHz, while sensitivity is -50 dBm/Hz at 10 MHz and -147 dBm/Hz at 1 GHz. In addition, with two independent display channels available, you can simultaneously view network and spectrum (or transmission and reflection) characteristics of the device under test in split-screen format. For example, an amplifier''s frequency response (network measurement) and distortion (spectrum measurement) can be shown at the same time.